The coach feeds the ball to the backhand side and the player hits high topspin backhand down the line. The coach feeds shorter ball to the forehand side and the player executes forehand drop shot down the line. Tennis players have automatic habits according to strokes and tactical decisions but they have to also learn how to adapt them while playing against a lefty. It is important to make proper decisions under pressure, so if you only spend time on these areas during training, it is possible to have high rate of success. There are a lot of players who lose to weaker players who play with left hand because they are not able to change their execution habits. That is why it is important to implement different scenarios and train with different hitting partners to be ready for all events. In this drill, the player works on strategy that can put left-handed opponent in trouble. 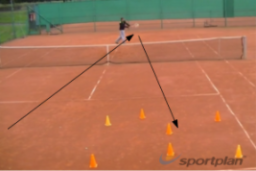 By playing a high topspin backhand down the line, the player forces the opponent to move back and hit difficult backhand way behind the baseline. It simply creates tactical advantage on the court and opportunity to be offensive on the next shot. A lot of rivals will not be able to come up with deep and challenging ball so more than often we can expect a shorter ball to come. 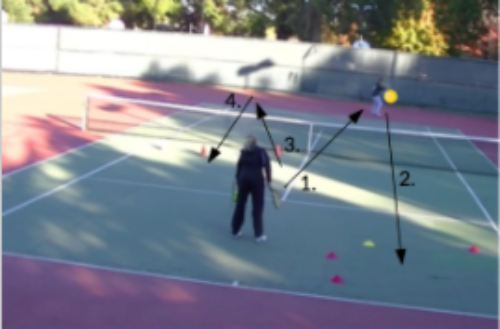 By executing drop shot on the next ball, the player creates a simple tactical pattern that can bring many points against left-handed opponents. The coach should emphasize that the first shot should be hit with heavy topspin, because without it, the opponent will not have to move back to answer it effectively and the whole strategy won't work out. 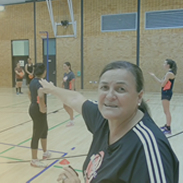 How do I coach 14 girls (varying abilities) on just 2 courts? Fun technique drills for 4-5 year-olds?